Despite the periodical rain and the annoying drunks that come with every concert, May Day rocked pretty hard. 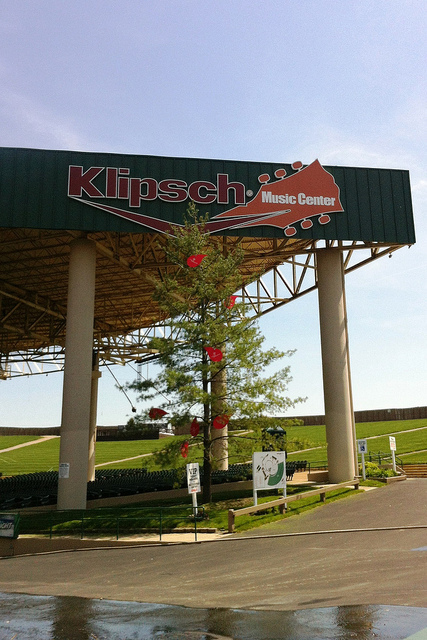 Seeing as Indiana weather is bipolar, it couldn't decide whether to rain or let the sunshine, but that didn't stop the droves of fans piling into Klipsch Music Center in Noblesville, IN. This year there was a surprisingly diverse group of concert goers ranging from children to middle aged adults. This, combined with the killer line-up, made for an awesome and entertaining concert experience. On main stage, New Politics opened with a very energetic set with a retro-ish style of music and insane break dancing skills. While performing, the lead singer would do headstands or back flips and even at one point balanced on his head while singing. The whole band seemed to be enjoying themselves and were all smiles for the whole set. I guess it does pay off to do what you love. The second band, Awolnation, had a killer show and a massive crowd response. The light show was fantastic and the energy of the crowd was enough to keep the cold and rain soaked fans begging for more. It’s always nice to see a band get on stage and put their entire heart and soul into a performance for their fans. During the breaks between bands you could meet and greet with the (very cold and wet) bikini girls of Indy’s X103 radio station and the Colts’ new quarterback, Andrew Luck, introduced the upcoming bands. Or, if “celebrity” meet and greets aren't your thing, you could hop on over to second stage where The Virginmarys put on a killer show. Being a 3 piece band out of England. they brought their individual style to the American rock stage with and incredibly energetic and powerful performance. The band sounded great with a mixture of rock with a little bit of punk attitude mixed in. I don’t think I've seen a more energetic and showman drummer in a very long time. The Virginmarys are definitely an upcoming band to keep your eyes and ears on. Back on main stage, Buckcherry didn’t fail to impress with an awesome show and a lead singer bearing an uncanny resemblance to a young Danny Bonaduce. It was yet another spectacular light show and great performance with some sexual humor sprinkled on top. The real star of the show though was Bush who rocked so hard I lost my socks. Gavin Rossdale and the rest of the band put on a phenomenal show and left the whole crowd begging for more. Everything was spot on and perfect in its execution until Gavin Rossdale decided to run off stage and into the crowd in the lawn. 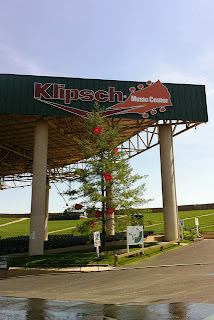 If you don’t know much about Klipsch Music Center, the lawn is HUGE with very few security guards to watch all those people. As to be expected, the crowd mobbed poor Gavin and wouldn't let him get back to the stage until a decent sized group of security officials came and forced their way to him. After about 10 minutes of struggling with the crazed crowd, he was returned to stage to rock everyone’s pants off to match their missing socks. To date, I must say, May Day 2013 was one of the best music festivals I have attended. The line-up was killer and all the bands were precise in their performances.